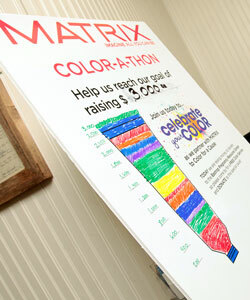 Salons, stylists and citizens in Austin, TX came together for a great cause on March 9, when they all participated in the first ever Matrix Color-A-Thon to raise needed funds for the Bastrop Pregnancy Resource Center. The city of Bastrop, TX was devastated this past fall by raging wildfires. Hundreds of families had to be relocated and lost everything in the flames. The Bastrop Pregnancy Resource Center provides information on pregnancy and adoption, along with counseling and essential items like baby food and diapers, in a loving and non-judgmental environment for women of all ages. 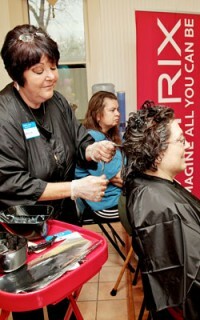 According to Matrix Assistant Manager on Color Sam Goodman, the participating salons — Best Lil’ Hair House in Texas and LeAnn’s Salon of Bastrop and Heavenly Hair Salon and Spa of Elgin — almost doubled the initial event goal, raising a whopping $3,372 for the Center. Prior to the event, clients were invited to book appointments for a free hair color service, selecting from a menu that included Matrix color glossing, face-framing highlights and grey blending, in exchange for a donation to the Pregnancy Resource Center. Eight volunteer colorists from the three salons, along with Matrix educators Leticia Ysassi, Jessica Viesca and Liz Muniz serviced more than 90 clients throughout the day. Victims of the devastating Bastrop fire were invited to receive free color services, but according to Goodman, many were moved to make donations anyway because of their strong support for the cause. NaturallyCurly.com editor, Tracey Wallace, even made the drive out to Bastrop to partake in the event, having her hair colored and getting to experience the first ever Color-A-Thon in history! Chairs of Change is an initiative, launched by Matrix in January 2011, that empowers, inspires, and rewards hairstylists who are making an impact on their own lives, their communities and in the world. All of the stylists at the Color-A-Thon used Matrix haircolor — including SOCOLOR and Color Sync – the highest performing and most in-demand color among salon professionals in the U.S. Matrix provided the color and backbar supplies for the event, along with refreshments, decorations and the Design Pulse styling products that were available for clients to use in the blow dry and styling room after their color services. In addition, a massage therapist from Heavenly Hair Salon and Spa was on hand offering free massages, and volunteers from the Pregnancy Resource Center helped out by serving food and providing information. To add to the fun, each guest contributing more than $25 was automatically entered into one of five raffles. Prizes included gift certificates to each of the participating salons plus two fabulous make-up and fragrance gift baskets. The success of the Color-A-Thon was largely thanks to Matrix Territory Manager Garrett Rossero who organized the three salons and laid all the ground work for a great event. The Color-A-Thon was part of an ongoing series of Chairs of Change events nationwide. Chairs of Change is an initiative, launched by Matrix in January 2011, that empowers, inspires, and rewards hairstylists who are making an impact on their own lives, their communities and in the world. 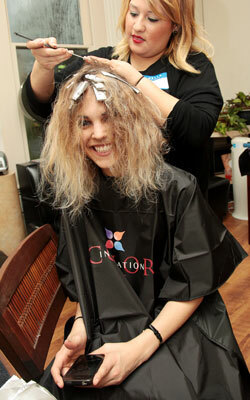 According to Goodman, at least 15 percent of the Color-A-Thon participants were walk-ins who normally could not afford a professional color service. Many more were introduced to Matrix products and techniques for the first time.